Langer (Practitioner) – Why Partner With Us? 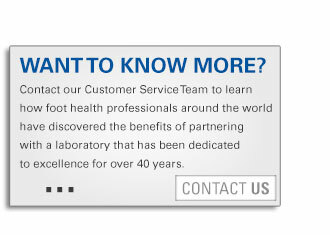 Langer Biomechanics has been a partner to foot health professionals for over 40 years. Our commitment to education, innovation and quality is well recognized. As one of the leading manufacturers of custom made foot orthotics and other lower extremity devices, we continue to invest in our partnerships. In addition to these association relationships, Langer attends a variety of regional and national conferences and provides financial support to the many associations who sponsor them. Our commitment to our clients has remained constant for over forty years. We proudly count among our loyal customers many of the leading practitioners in North America. Through their partnership with Langer Biomechanics, they have been able to more effectively serve the needs of their patients and achieve overall success in their practices.